Superman is alerted to a breakout in progress at Stryker’s Island Prison where a group of his old foes are in the process of releasing even more of his old enemies. The hero moves into action but is quickly overwhelmed by sheer weight in numbers, but notices certain villains like Psi-Phon are only attacking physically, which indicates to him that something is wrong. Upon awakening from his beating, Superman heads off to work at the Daily Planet, hoping to learn more about what is going on. While in his civilian guise of Clark Kent, he discovers that LexCorp has just secured the OverLord armor for studying. 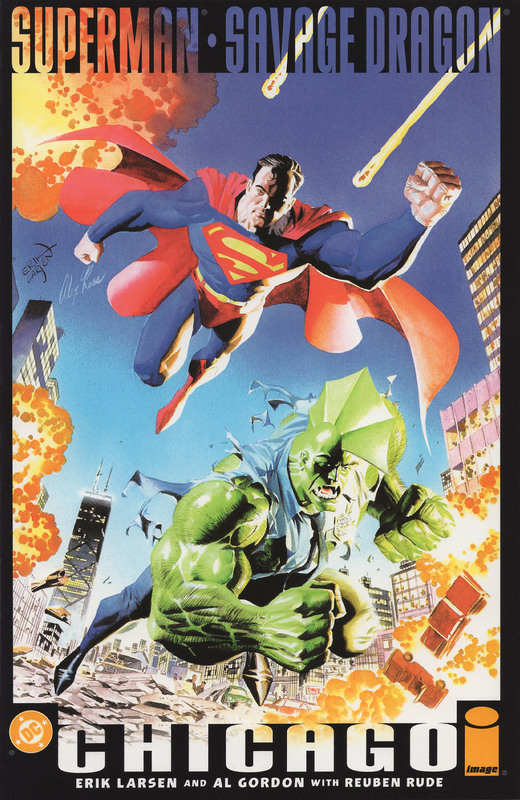 He is assigned the task of investigating this event while Lois Lane is sent to Chicago where even more of the Man of Steel’s enemies have been sited. Meanwhile in the aforementioned Chicago, Dragon answers a call about a break-in at an electronic facility and encounters the Vicious Circle as well as some of the Metropolis supervillains. He is unable to stop them from leaving with their desired goods and is left unconscious. Once he has recovered, the policeman is informed that he is being sent help in the form of Superman to help deal with this increased supervillain population. Back in Metropolis, Lex Luthor hopes to discover all of the secrets of OverLord’s powerful battlesuit and hopes to download his own mind into it before his dying body gives up on him. A group of Vicious Circle members invade his laboratory and attempt to steal the armor but it retreats with a new host within, leaving with no one present aware of where it has gone. Almost as soon as he meets him, Dragon is less than impressed with his temporary partner and his jealousy over Superman leads him to acting like a real jerk. The pair go out on a patrol and end up being ambushed by a large contingent of freaks and other supervillains, some of whom are revealed as robotic constructs of the original while some of the other Metropolis criminals appear to be possessed in some form. Never the less, the heroes are overwhelmed and taken back to Pipetown where they are hooked up in a recently constructed siphoning device. Alex Wilde had followed the two superheroes and watches as their energies are being drained off in an attempt to regenerate CyberFace, who has recently begun growing weaker. She destroys the siphon with some carefully aimed gunshots and allows the prisoners to escape. Dragon realizes that the possessed villains are victims of the leeches that have plagued Chicago for some time and sets about destroying them to leave their hosts incapacitated. OverLord appears and declares his desire to retake the Vicious Circle and proves incredibly formidable by taking down Superman. His failsafes are targeted once more by Dragon to allow his ally to knock out the powerful foe, revealing that Lex Luthor has unknowingly been trapped within to act as host for the deceased crimelord to try and regain his seat of power. Back at the Chicago Police Department, a job well done is celebrated by Dragon who realizes that he has been harsh with Superman. The Man of Steel feels that they have somewhat failed as Lex Luthor has gone free yet again but he agrees that they stopped the Vicious Circle’s plans which is good enough for now. The pair then reconcile their differences before they are taken by Lois Lane out for a meal so that they can become proper friends.